It is a dark and stormy night when we meet Meg, Charles and Mrs. Whatsit. Meg with her mousy brown hair, braces and quick temper is accused of acting like a baby by girls at school. Charles didn't talk until he was five years old and everyone thinks he is a moron. But, the truth is that Charles is a very brilliant and unique human being and he is about to join with Meg, a cool kid named Calvin, and the very special and wonderful Mrs. Who, Mrs. Whatsit and Mrs. Which on a journey to find their missing father, a scientist. 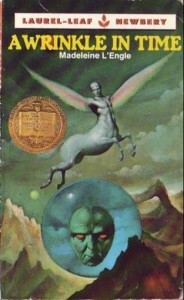 They will travel through a tesseract-a wrinkle in time. This is one of the most magnificent books ever written for children.